Hi, I'm Frank from Chile, Pancho for friends. Right crankcase, cylinder blocks, valve cover, CM250. Left crankcase, head, camshaft, CB450 Nighthawk. Little to do?? Noooooooooo! I plan to have 77 mm bore cylinders to have 450 cc very soon. The bike is already running in the 250cc class. Ending rear mudguard gas tank and take her to 450 cc and devour roads! AH! The whitewall is painted with a paint that I make, it takes 3 months white! Rear pull is cracked, not the paint. This Honda CM 250 is the third bike I built. The next will be a an old Maico MD250. 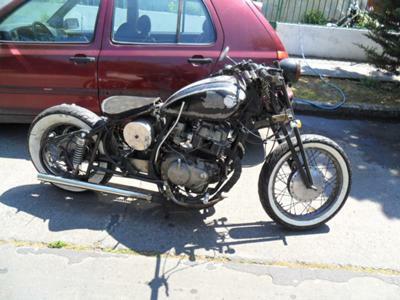 I want to transform it to a Caferacer, but transforming the 500 cc engine to 1 cylinder, 4 stroke. We'll see which toy it is. A hug from a distance! I like the bike I'm working on the same project. Where did you buy the seat? Expected to be completed! I'm still working on it, will be completed beautiful! Join in and write your own page! It's easy to do. How? Simply click here to return to Honda Choppers.